Motors, Gear boxes and Drive Shafts, which count for 95% of the operational problems are absent in AQUAFAN cooling towers. The only moving part, the fan/turbine assembly, runs on a set of graphite impregnated Teflon bearing rings on a stainless steel sleeve. Lubrication is achieved through a constant supply of cooling water. Inspection or replacement of the bearing rings can simply be done by unscrewing the cover plate and removing the whole turbine set. When more than one module is being used, this can even be done in as little as 10 minutes by switching off the cell to be inspected and eliminating the need shut down the entire cooling tower process. The AQUAFAN cooling tower requires minimal maintenance. Using a modular system in the larger capacities greatly simplifies the use of spare parts. The only parts to have on stock is a set of bearing rings. The general life time of the bearings depend on the operated water quality and is between 1 and 3 years. Routine maintenance of the AQUAFAN cooling tower is hardly necessary. It is recommended to inspect 4 times annually the complete condition of the turbine, the bearings, the drift eliminators and the packing. To remove, pick up and move aside, the drift eliminators, and the AQUAFAN cooling tower is accessible from the top. The turbine is also easy to access in this way. Cooling towers with electric drives should be lubricated and inspected regularly at various points. 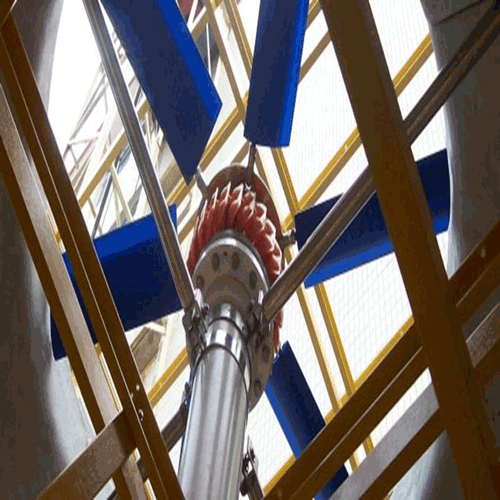 Lubrication of an AQUAFAN cooling tower is achieved automatically by the circulating cooling water. This system has proved itself during more than 25 years in numerous operating modules and to the full satisfaction of their users. Also see the reference list. Another advantage is the choice of material for the turbine/fan unit, namely ABS plastic and stainless steel. Corrosion is excluded here. 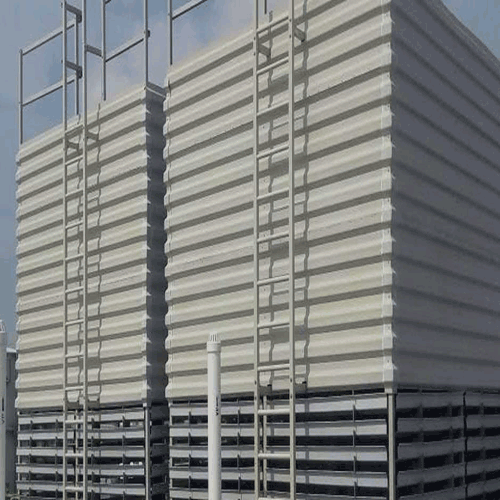 The other parts of the cooling tower are likewise designed from corrosion resistant materials. Certainly, by using light fans with a small diameter and low speed, there is no damage in the event of one of the fan blades breaking. Damage which can occur with the use of heavy motors and/or large fans is not possible with the AQUAFAN cooling tower. The turbine design creates an even distribution of water droplets eliminating the need for nozzle dispersion of water.